All Monsters Attack! 50 Classic Movie Trailers DVD New Sealed Out of Print! MyMovieMonsters.com > DVDs > Vintage Horror > All Monsters Attack! 50 Classic Movie Trailers DVD New Sealed Out of Print! No animals were harmed in the making of this DVD ... only people! More than 50 classic horror and sci-fi movie trailers. They're colossal, they're hungry, and they're coming this way! Here's the most gigantic assortment of oversized beasts, behemoths, dinosaurs, and indescribable space creatures ever to overwhelm your video screen. See The Colossal Man, The 50 Foot Woman, Kronos, Gorgo, and Gwangi! See pioneering special effects work from Willis O'Brien, Ray Harryhausen, Jim Danforth, and others. 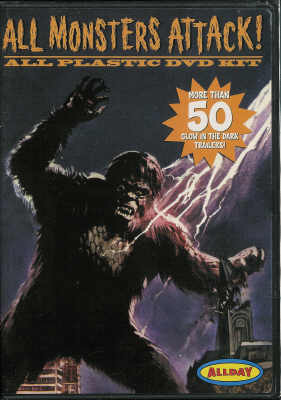 DVD includes a collection of more than 50 original sci-fi/horror trailers and extras that baby boomers will remember watching on TV and in theaters as a kid. B-movie fans and Godzilla/Kaiju enthusiasts are in for a real treat. See the Colossal Man, the 50 Foot Woman, Kronos, Konga, Gorgo, Gwangi, Varan the Unbelievable, and Yog, Monster from Space! See San Francisco smashed by a massive octopus in It Came from Beneath the Sea! See Chicago sacked by gargantuan grasshoppers in Beginning of the End! See Arizona invaded by big bunny rabbits in Night of the Lepus! See pioneering special effects work from Willis O'Brien, Ray Harryhausen, Jim Danforth, Eiji Tsuburaya and others, from the Golden Age of sci-fi thrillers!